Congrats MonkeyKingAerhyn on the FTF! Tweezers Needed. BYOP. Use Stealth!! Please return exactly where found. 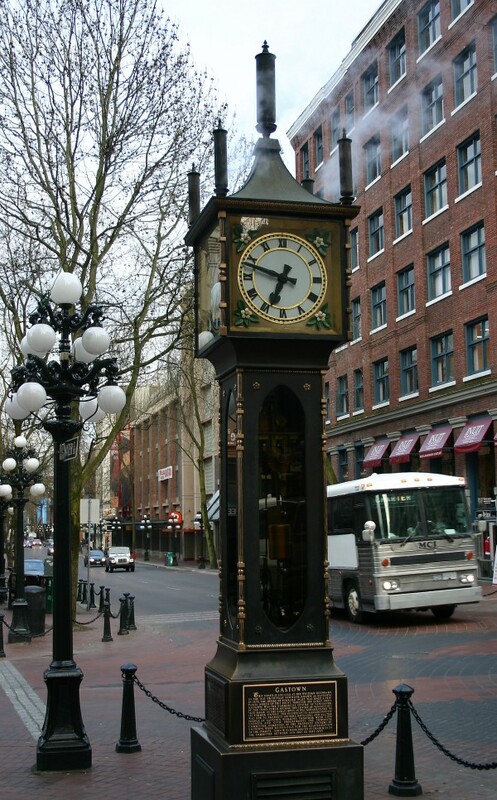 Raymond Saunders' first steam clock was built in 1977 to solve the issue of a steam vent in a popular sidewalk in the Gastown district of Vancouver. Now owned by the City of Vancouver, funding for the project (over $58,000.00 CDN) was provided by contributions from local merchants, property owners, and private donors. The clock displays the time on four faces and announces the quarter hours with a whistle chime that plays the Westminster Quarters. Engine. The steam engine is a Stuart #4 single expansion double acting 1" piston engine purchased at the Stuart Turner Limited plant at Henley-on-Thames, England. (Engines of this size are typically employed by hobbyists for large model boat propulsion.) It is supplied with low pressure steam — engine inlet pressure is 17 psi (120 kPa) — from a centralized steam heating system that serves a portion of downtown Vancouver. The engine, rotating at only a few hundred revolutions per minute, drives a reduction gear train. The gear train drives an ascending chain lift to lift ball weights to a top track from which they load onto a drive chain providing the driving force to the clock while the ball weights descend. Chain lift. The engine-driven gear train drives the lower sprocket of a vertical link-chain (similar to a bicycle chain), with a lift of about four feet. Chain-mounted pairs of lifting fingers form forks which accept and lift smooth steel balls (about two inches in diameter). The balls are lifted at a rate of one every 4.5 minutes. Top transfer. A hammer-like mechanism operates to drive the topmost ball from the lifting fork at the top of the lift. The ball is then received by a transfer chute, whence it is routed to a gate at the top of the drive chain. The ball is restrained until a descending clock drive chain fork is properly positioned to receive it. Clock drive chain. A similar continuous chain receives the lifted balls from the transfer chute at the top of the mechanism. At any time, five or six balls are being carried by this chain. It is the unbalanced weight upon this chain that drives a conventional pendulum clock mechanism through the upper sprocket. Ball return. At the bottom of the clock drive chain the balls come to rest upon an inclined blade leading to a chute where they roll to the initial lifting point. Two or three of the balls are in this position, with the foremost awaiting the passage of the lifting fingers. Clock movement. The Gastown clock keeps time by a small tower clock movement that was custom-built in Croydon, England by Gillette & Johnston Co, from one of their 1875 designs. This type of tower clock movement was used in many small church tower clocks after 1875. Electric motors. The clock uses three electric motors. First, a small gear motor drives the tune playing machine. It rotates a drum with pins that play the Westminster chimes on micro switches which operate the steam whistle solenoid valves. Second, a small fan motor blows out hot air from the roof vent on top of the clock. Third, a small fan motor pulls warm air down to the base to provide air circulation. Chiming mechanism. Five steam whistles are mounted atop the clock case. The large central whistle, off the CPR steam tug Naramata, counts off the full hours. The four auxiliary whistles chime the Westminster Quarters four times an hour. Fgbc naq fvta gur pnpur unatvat arneol.